MINIX NGC-1 mini PC is powered by an Intel Celeron N3150 quad core “Braswell” processor with 4GB RAM and a 128GB M.2SSD, and pre-loaded with Windows 10 Home. While the product aims to provide a convenient alternative to Intel NUC kits, as everything is pre-assembled and pre-installed, I’ll also compare the experience to Bay Trail and Cherry Trail mini PCs such as MeLE PCG03 or Tronsmart Ara X5. I’ve already provided NGC-1 specifications and some pictures, so today, I’ll test the capabilities of the device, and run some benchmarks in the review. Once you’ve connected a USB keyboard and mouse, and the power supply, you are ready to start. Press the power button, the blue power will lit on the front of the device, and you’ll hear a beep and the very first time system will boot to Windows 10 setup screen where you’ll be asked to set the language, read and accept Windows’ EULA, configure the network, and select Express Settings, and you should have access to Windows 10 desktop. For most people that’s all you need to do. Next time you boot, it should take between 20 to 30 seconds to get to the desktop, unless of course Windows decides it’s a good time for an update in which case it might take much longer..
Video output was automatically configured to 1080p59, but since I connected the computer to a 4K television (LG 42UB820T) via an Onkyo AV receiver, I could also select 4K resolutions such as 3840×2160 or 4096×2160 up to respectively 30 Hz or 24 Hz as the computer features an HDMI 1.4 port. But for some of the review, I selected 1080p60 settings, expect when I played 4K videos in Kodi. 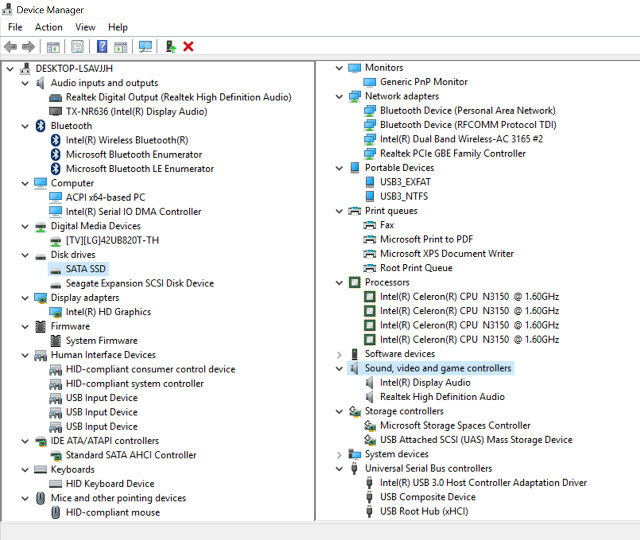 If you have connected speakers to the 3.5mm audio jack, Windows 10 should automatically detect it, but in case you get no audio, you may have to click on the Speaker icon on the taskbar to change the Playback device to Realtek High Definition Audio. Let’s go to Control Panel-> System and Security -> System to double check the main hardware and operating systems. 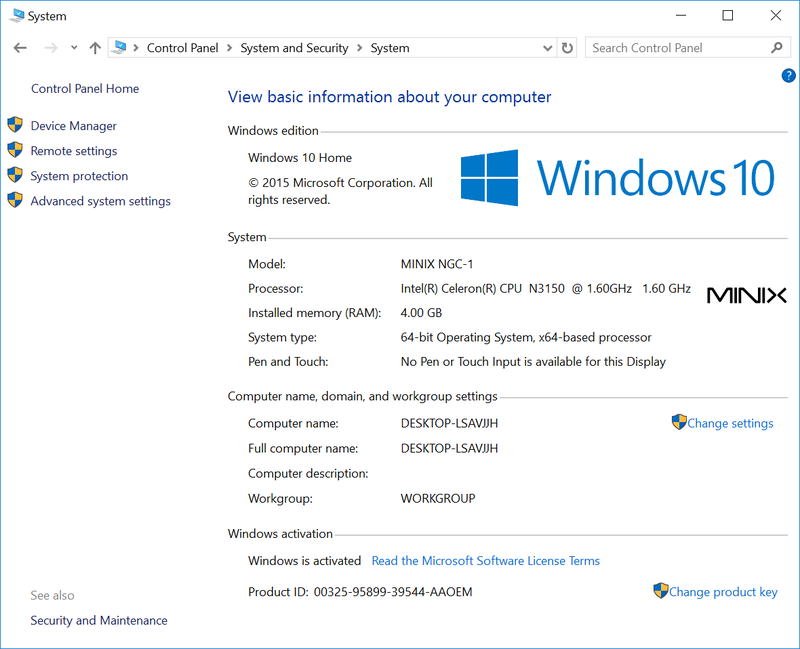 MINIX NGC-1 with Intel Celeron N3150 processor @ 1.60 GHz, 4GB RAM, and Windows 10 Home 64-bit activated. All good. One of the downsides of low power mini PCs so far is that they come with only 32GB internal storage which, unless you only run one or two apps, will get filled pretty quickly. MINIX mini PC does not have this problem, as a 120 GB SSD is include, and shows a 118GB capacity with 99.7GB free in Windows, so I did not run out of space at any time. 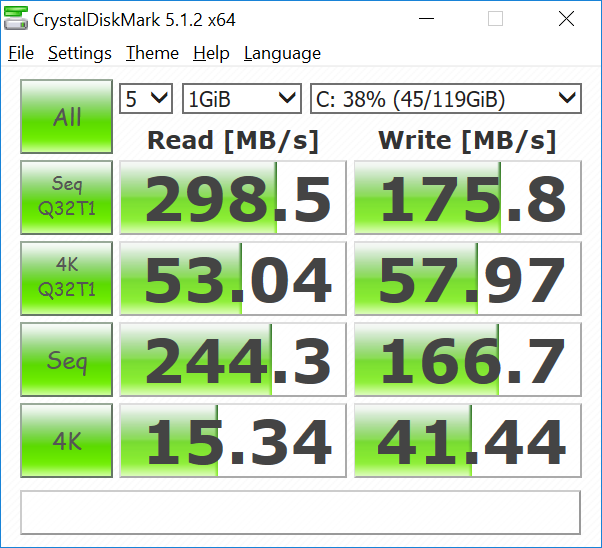 I could also connect a Seagate USB 3.0 hard drive with four partitions to one of the USB 3.0 ports, and while as expected, the EXT-4 and BTRFS partition did not get any love, the system mounted both NTFS and exFAT partitions. If you want a more detailed views of all hardware I’ve included a screenshot of the Device Manager. Notable hardware include the SATA SSD (unnamed, but I’ve been told it’s a Toshiba model), Intel Dual Band Wireless-AC 3165 module, Realtek PCie GBE controller, and more. 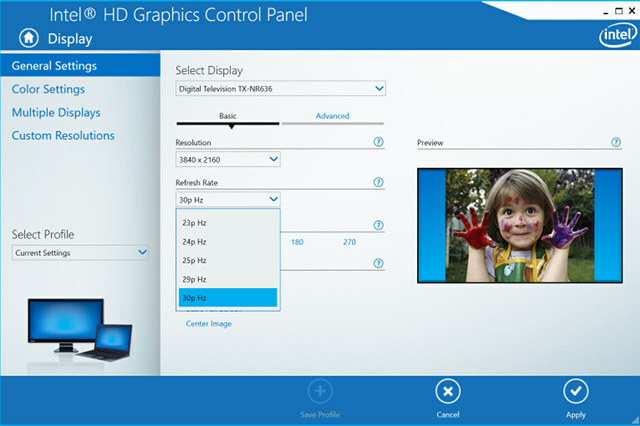 Running HWiNFO64 also shows the capabilities of the processor, GPU and memory configuration. 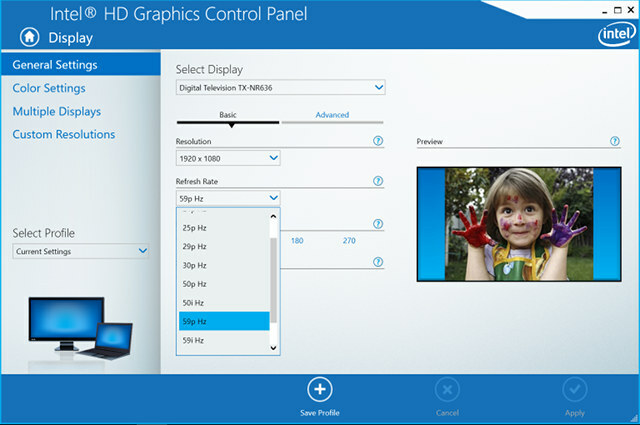 For example, N3150 support dual memory channel, but the company opted for single channel configuration instead. The CPU features (green) are exactly the same as Intel Atom x5-Z8500, and the GPU is detected as Intel HD graphics 400/405 clocked at 320 MHz (base frequency). 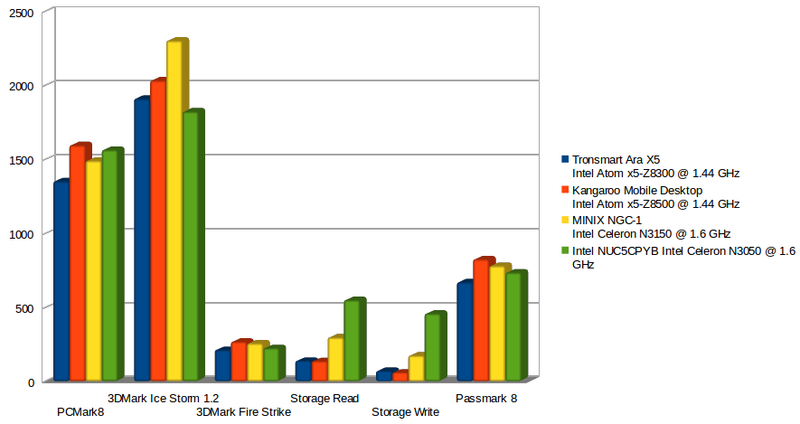 I’ve run both PCMARK 8 HOME 3.0 Conventional (Baseline) and Accelerated benchmarks. Tronsmart Ara X5 got 1,048 points, and MeLE PCG03 got 1,052 points in the conventional benchmark, so in terms of performance NGC-1 is about 20% faster than their low end and much cheaper platforms. You can check the full NGC-1 report for Conventional and Accelerated results. 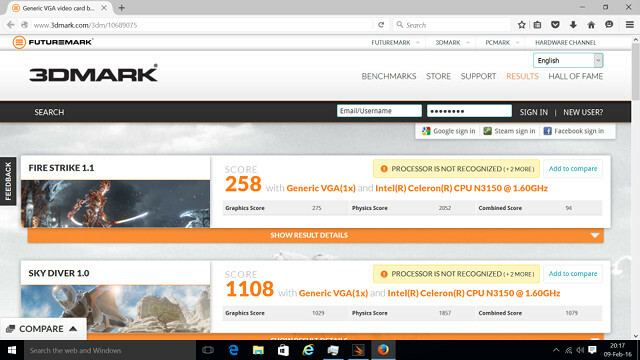 I’ve also run 3DMark to get a better idea of graphics performance. You can see the full results on 3DMark website, and the performance is a little better than Intel Atom x5-X8300 based Tronsmart Ara X5. However, when we compare the storage results, NGC-1 is clearly ahead, and sequential read speed (298.5 MB/s) is well over three times faster then Ara X5, and nearly twice as fast as MeLE PCG03, and sequential and random write speeds are even better. 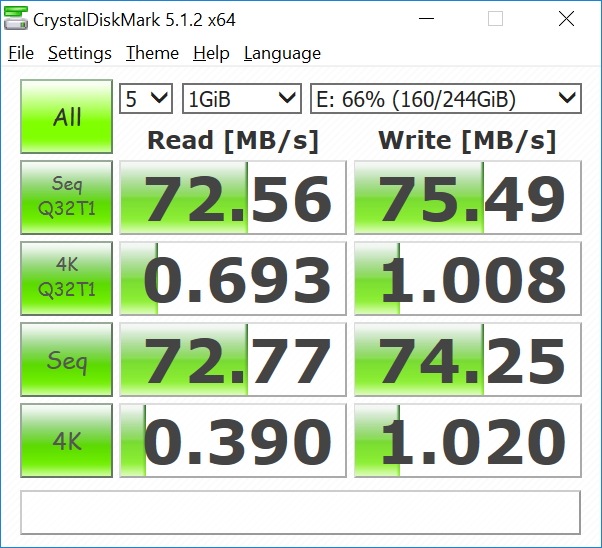 My USB hard drive did not work on Tronsmart Ara X5, but it did on NGC-1, and the performance is pretty good, although NTFS appears to be faster than exFAT based on CrytalDiskMark benchmark results. However, please note that mechanical hard drive performance may differ between partitions as you get further from the center, and in my case is higher on partition 1 compared to partition 4. (NTFS is partition 1, exFAT partition 3). Few low power mini PCs support Gigabit Ethernet and/or 802.11ac WiFi but NGC-1 supports both, and I tested network performance with iperf 2.x. 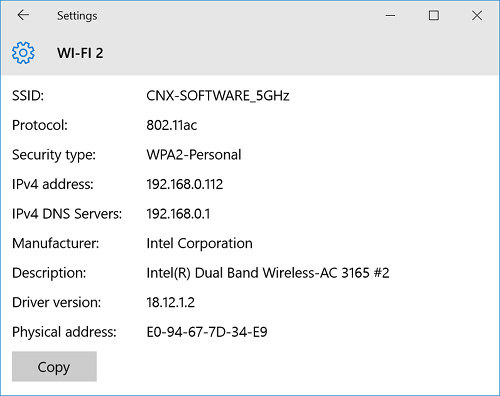 I’ve started by connecting NGC-1 to my 802.11ac router, and running the full duplex test. I’ve compared the results against other Android and Windows 10 devices tested with iperf, and NGC-1 is right in the middle. I ran the test a few times with similar results, so I also run the test again in only one direction but again, the performance is similar. I switch the Gigabit Ethernet and ran the same test. 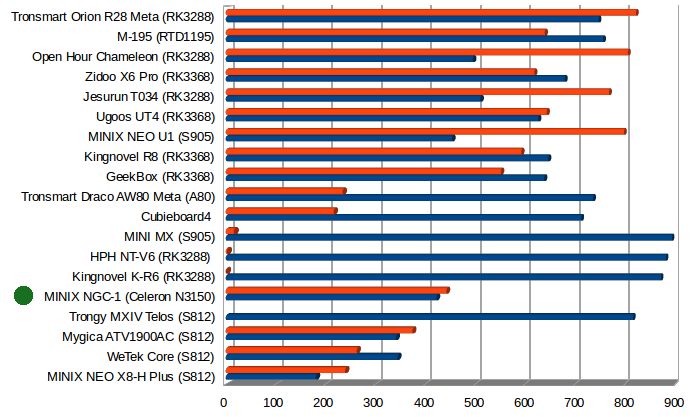 Compared to Android devices, the performance is lower than average. Both of these tests assume iperf client behaves the same in Android and Windows. But I’ve noticed that if you do this in full duplex, the other direction performance will suffer. So while the wireless and wired networking performance is much better than with other low power Intel platforms I’ve tested, I was expecting even more. 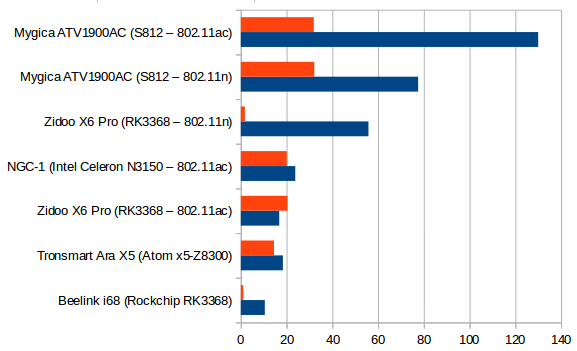 I’ve summarized some of the results above in a chart comparing MINIX NGC-1, an Intel Celeron N3050 (dual core) NUC with 4GB RAM and a 120GB SSD, Kangaroo Mobile Desktop (Atom x5-z8500), and Tronsmart Ara X5. The results for Ice Storm 1.2 were divided by 10 to provide a readable chart. There are some minor improvements between Cherry Trail and Braswell platforms, but the greatest difference is the storage performance thanks to SSD used in Cherry Trail platform. The data for the other three platforms comes from a table released by Linuxium. Benchmarks are one thing, but at the end of the day, you’ll want to know what you can do with your mini PC. 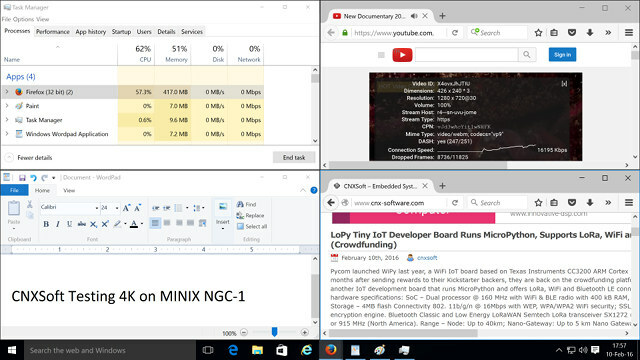 While low cost low power mini PCs with 2GB RAM and 32GB storage are fine as an HTPC, they come short as a desktop platform, and since MINIX NGC-1 has 4GB RAM, and 120 GB storage, I’d expected to be a potential desktop replacement. Kodi 16.0 RC3 @ 4K resolution with 1080p & 4K videos using H.265 or H.264 codecs. You can watch the full tests in the video below. The main takeaways are that MINIX NGC-1 is perfectly usable as a desktop machine, and multi-tasking between apps did not lead to slow-downs. YouTube videos (VP9) do not play smoothly in Firefox, but are fine in both Chrome and especially Microsoft Edge, so that with great disappointment, as a Firefox user, that I have to recommend the two others browsers on NGC-1. Candy Crush Saga is playable on the machine, but not quite as smooth as one my now mid-range Android smartphone (quad core Cortex A53). Asphalt8 is playable, but I’m not fully satisfied with the frame rate. I switched the 3840×2160 @ 30 Hz before launching Kodi 16.0, and reboot the machine. H.265 videos could not play with hardware decoding (XVDA2) and all I got was a green screen for all videos. Both 1080p and 2160p H.264 (8-bit) videos up to 30 fps could play smoothly, and were using hardware (XVDA2) video decoding. However, 10-bit H.264 switching to software decoding, and the 4K sample I tried had a lot of artifacts, and was not very smooth. 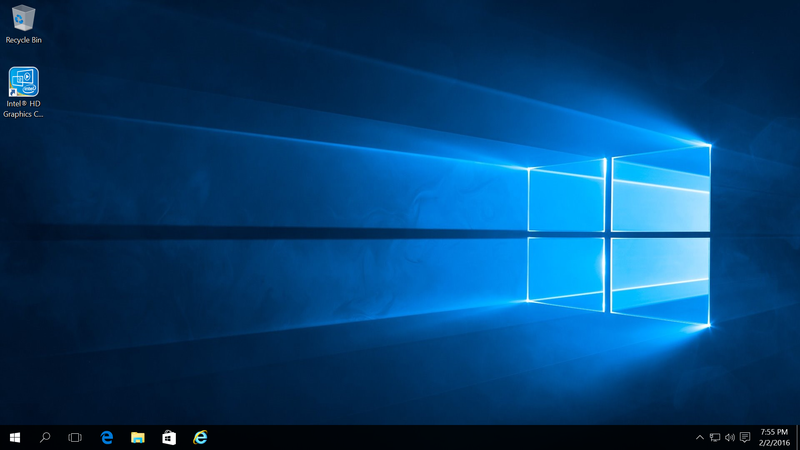 If you wonder what a 4K desktop may look like, I’ve tiled 4 windows while the resolution was set to 3840×2160. I also played Asphalt8 at 4K resolution, and it was not as bad as I would have expected, although it’s not really enjoyable at that resolution (and frame rate). The main differentiating factor between devices with apparently the same specifications are thermal design, and if it done the wrong way it may negatively affect performance of the machine. 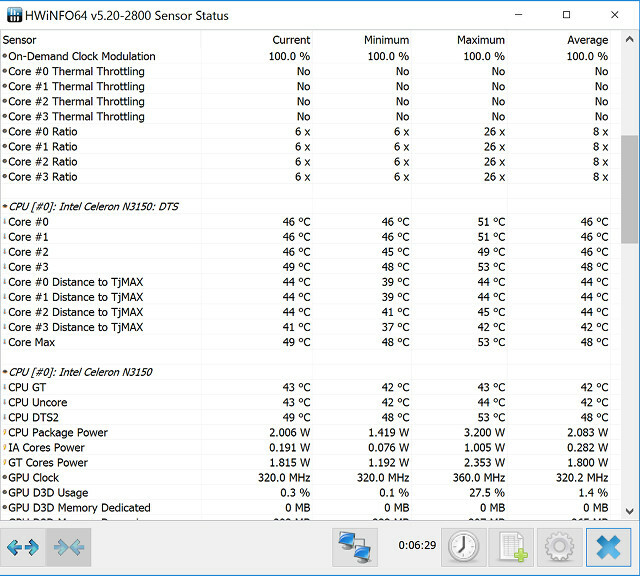 I had some worries with my first NGC-1 sample as it would quickly throttle, and even at 220 MHz be very close to TjMAX (the maximum junction temperature), which lead me to write How to Check CPU Throttling in Windows 10, and since there was no easy solution, the company sent me a new sample, and I sent back the old one to Hong Kong for investigation a few days ago. 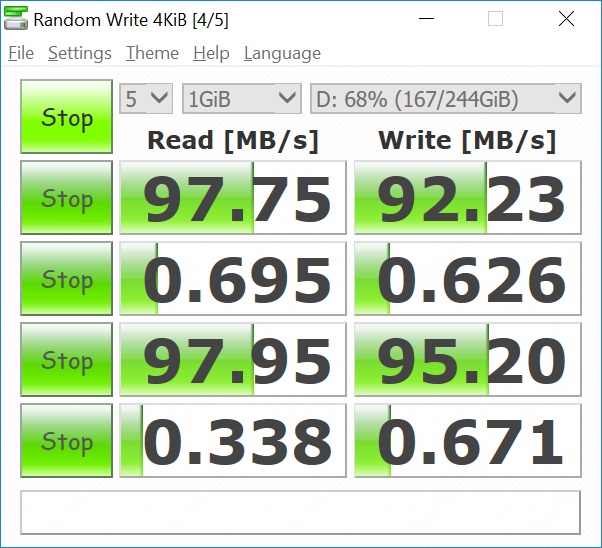 The good news is that the new sample works very well, and at no time during my testing the processor throttled, even after three hours playing 1080p videos, something that bogged Tronsmart Ara X5 after 30 minutes. Why is MINIX NGC-1 so expensive? When MINIX Braswell mini PC was released most people talked about its price: $399. The company provided some explanations how the price. Metal case for passive cooling made by Apple’s MacBooks supplier. The company also mentioned that NGC-1 can be summed up as a pre-installed NUC at no extra cost. MINIX NGC-1 is a solid fanless machine with constant performance, very fast storage, that just works, and makes a decent desktop PC. However, I can’t really recommend it for pure HTPC use due to the price, as you’ll find something that works just as well for half the price or less. At 299, maybe. 249 quite certainly. 399? No way. I have to say the price is crazy! Good PC indeed but you can get so much better for that price bracket! The USB drive that didn’t worked with the Tronsmart… does it feature an USB-to-SATA bridge that is UASP capable? I ask since I’m currently testing the “UP board” (also based on Cherry Trail / x5-Z8300) and none of my UASP enabled enclosures works there. The UP guys could reproduce the issue with other Cherry Trail platforms and currently all that helps is to blacklist the chipset IDs in /etc/modprobe.d/uas-blacklist.conf (Sorry, no Windows). I’m not sure. How can I check UASP capability? 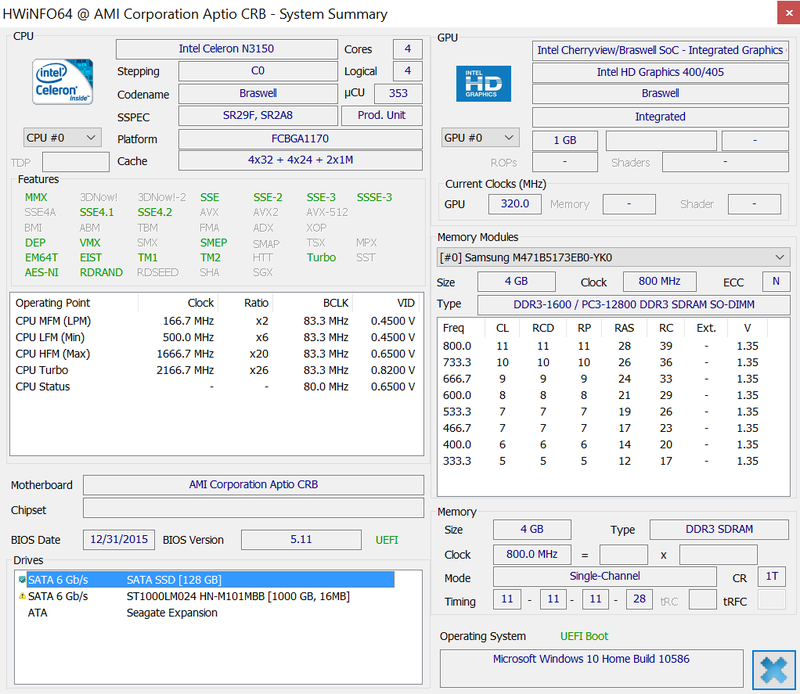 The drive did not work with Tronsmart Ara X5’s USB 3.0 port, but did work with the USB 2.0 ports. Did you get an answer why the 1st unit was faulty and throttling? Or just a bad one off item or bad contact when put together? I just gave it back when UPS brought the second sample two days ago, so I don’t think they have it yet. They’ll probably find out next week. I’ve not the slightest idea how to do that on Windows. But it’s enough to check Vendor and Product ID so in Linux parsing ‘dmesg’ for ‘New USB device found’ or using lsusb should be sufficient. Windows should try to use UAS starting with Windows 8 AFAIR. why WiFi and Ethernet performance is so bad comparing to Android devices? At that price – I’m outa here. Note to CNXSoft mods, it would be helpful for us noobs if you had a ‘manufacturers link’ page on your website. It took me a while to determine that ‘Minix’ seems to be a Hong Kong based company with presence elsewhere. Somebody just informed me you can get a Windows 10 OEM license for $20 @ https://www.youtube.com/watch?v=yXTqz3Fd28M. Since MINIX is obviously an OEM, I don’t understand why they had to go with the retail license. which can be used just like genuine but not truly legal. how do they cool it? this is definetly smaller case, plastic …. The case is made of metal. Apart from that, I have not been able to open it, so I’m not quite sure. However, some other people opened the first sample back in October @ http://www.fanlesstech.com/2015/09/inside-minix-neo-z.html, and you can see a large heatsink. Having said that it’s possible they changed the design since then. Jetway JBC400 has similar hardware with Intel Celeron N3150, 4GB RAM, and M.2 SDD slot, but no Windows 10. With a 128GB SSD, and DIN rail mount, but no WiFi, no Windows 10, they stlll managed to outprice MINIX for 309.60 GBP. I purchased a unit yesterday for $Can 349 or ~ $US265.00 I think this is great value.